Beto played really well against Villarreal tonight and made a nice double save in the first half. He did concede a goal in the 79th minute when Vietto was through and scored a nice chip goal but Denis Suarez equalised in the 88th minute and Bacca scored from the penalty spot in the 93th minute to win the game for Sevilla. IMO Beto was the man of the match and Sevilla is currently sharing the #1 spot in Lliga with Barcelona. Marcelo has did an incredible job in El Classico. We all know there will at least one player in TOTW choose from EL Classico. Marcelo has been tremendous. I assume he is the likely TOTW candidate from this match with the way he played. As a LB, Avelar scored two goals for Caliari in an 4 goals game against Empoli. Besides 2 goals, he also keeps a clean sheet for his team, and he is also an Brazilian. Someone already bought a bunch of Avelar as stock. He deserve a black card this week. I don’t want choose Naldo this time because he has already be chosen as TOTW one time this season, but he really did an tremendous job in the game against Frankfurt. Not even a goal and an assist, he even keeps a clean sheet at the end, since there are few defender can be chosen, I give Naldo another shot. Gentner with the match winner at 5-4 what a crazy game! it’s a brace for him, he was a real leader as he should be, scoring two goals in order to come back twice, winning 5-4 against Frankfurt.This is truly a crazy game, go watch it – remember gentner is a CDM. This is how people loved football. An insane weekend for West ham United. A 2:1 won against Manchester City as underdog and got an 3 won in a row. If anyone from that match deserves a position in the team of the week, Song for sure. He did a great job on both attack and defend. He also got the man of the match officially. I assume a black card Song will come soon. Carlos Eduardo from Nice scored a hat-trick on first half. And an assist as well. The guy is on fire. Just made an absolute load on him as well. He scored 5 goals at last. He’s a no-brainer now. His BIN is already going for 25-30k though. I bet he would have a position in this week’s TOTW. Nordin Amrabat perform 2 assists and 1 goal for Malaga vs Rayo Vallecano. Has been in unbelievable form for them this season. He play as striker in this game but I still want put him at midfielder. He is good enough to get a position in TOTW this week. Karim Benzema has did an incredible job in.El Classico, which is one of the most important football match all over the world. A decisive goal for Real Madrid and two shoots on the post. Benzema has been chosen as Man of The Match in El Classico. There is no reason he won’t get a black card this week. Wilfried Bony scored two beautiful goals this weekend in a 2:0 game,which lead Swansea to a 2 balls win against Leicester. Bony played as a striker this game. His first goal happened at 33 minute and he scored another at 56 minute. Such solid performance should help him to be a TOTW candidate this week. 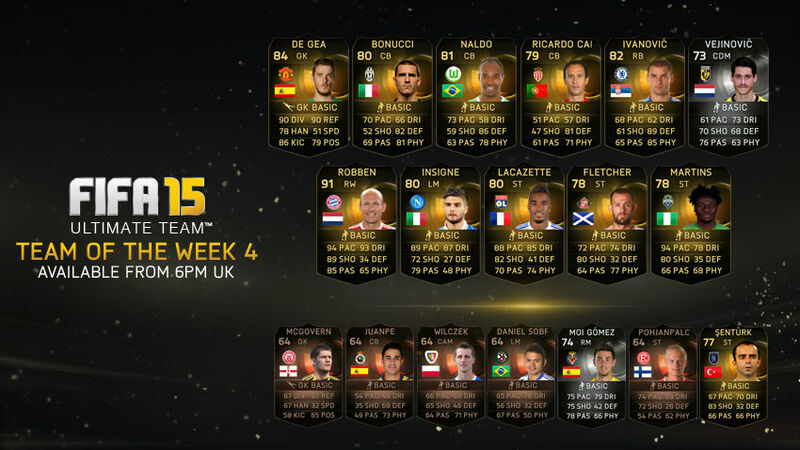 Besart Berisha is a reasonable candidate of TOTW this week I assume. He scored a Hat trick in a 5-2 win over Melbourne City, which is his team, Melbourne Victory, biggest rival. Also his teammate Archie Thompson 2 goals and 1 assist in the same game. I consider he is the right one to be chosen as black card. Want buy those incredible player instantly? Fifa15-coins lets you buy FIFA 15 coins at the lowest possible price. Fifa15-coins gives FIFA 15 Ultimate Team player around the world a great chance to bulid thier dream team. You can benefit from the lowest costs for buying, fastest delivery and credible safety guarantee. Fifa15-coins is part-owned by the Ugameshelp and is one of the world’s largest online game currency supplier. We take care of almost 20 kinds of games for more than 1 million players. You can purchase FIFA 15 coins at any time, without penalty, and your FIFA 15 coins will be wired within 5-10 minutes after personal information checked. Because of our size, you benefit from the huge stock we have stored, which can help you receive FIFA 15 coins immediately. According to the comparison. You will find Fifa15-coins delivery FIFA 15 coins at what are believed to be the lowest possible price among trusted dealers, no matter what size of dealing you choose. Fifa15-coins is also support all kinds of console include PC, XBOX ONE, XBOX 360, PS4, PS3, even Android and IOS. Buy cheap FIFA 15 coins at www.fifa15-coins.com, your dream team will come ture soon! EA had already unleashed the fourth week of FIFA 15 Team of The Week and it’s TOTW 4 that we’re focusing on now, and just like the squads before it, it hasn’t disappointed one bit. More high quality players are involved and there’s a couple from the BPL (Barclays premier League) as well after a great week of football. 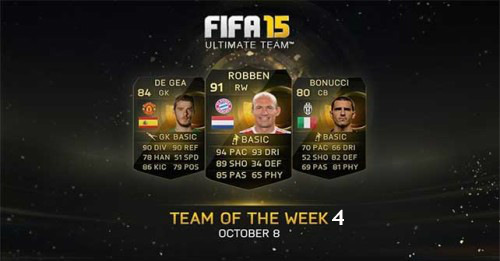 Big hitters such as Robben, De Gea, Lacazette are all IF (In-Form) and will be available to acquire on premium gold packs from 6pm (UK time), on October 8th 2014 up until 5:30pm (UK time), on October 15th 2014 up until 5:30pm (UK time), You will also be able to challenge this TOTW from the FUT hub on the main menu when you enter Ultimate Team, you’ll receive coins based on what difficulty setting you choose to select. Take a look at the full starting eleven, substitutes bench and reserve squad below and let us know in the comments section who you felt should have made this inclusion. We decided to play a match on Ultimate difficulty as per request of some of our YouTube subscribers and take on this epic team of the week squad. You can check out how we did in the most explosive final minutes of a match you’re likely to see all year round. Follow us on social media to stay up to date about happy hour information and when EA decide to release special jumbo packs. These packs will give you a greater chance of finding these IF players and bagging them for your Ultimate Team. We’ll be back next week with the fifth installment of TOTW so we shall see you then.